The 47 kilometer river, Marshyandi (locally known as the raging river of Nepal) is said to be the most magnificent class 5 rafting and kayaking river in the world. The river rises from the northern slopes of the Annapurna, flows east through the valley of Manang and joins the Trishuli river at Mungling. Unlike other high volume rivers like Karnali and Sun Koshi, the rapids of this river are technical and require a different approach. This river is one of the steepest rivers in Nepal combined with a captivating natural setting and a stunning view of Manaslu and Annapurna. The best seasons to join this intense and extreme rafting trip are October to December. Recently opened for commercialized rafting, the Marshyangdi is one of the best rafting routes in Nepal with continuous rapids of class 4 and 5. The combination of a thrilling rafting experience and magnificent scenery, Marshyangdi rafting is the perfect option for something seeking an adventurous trip. 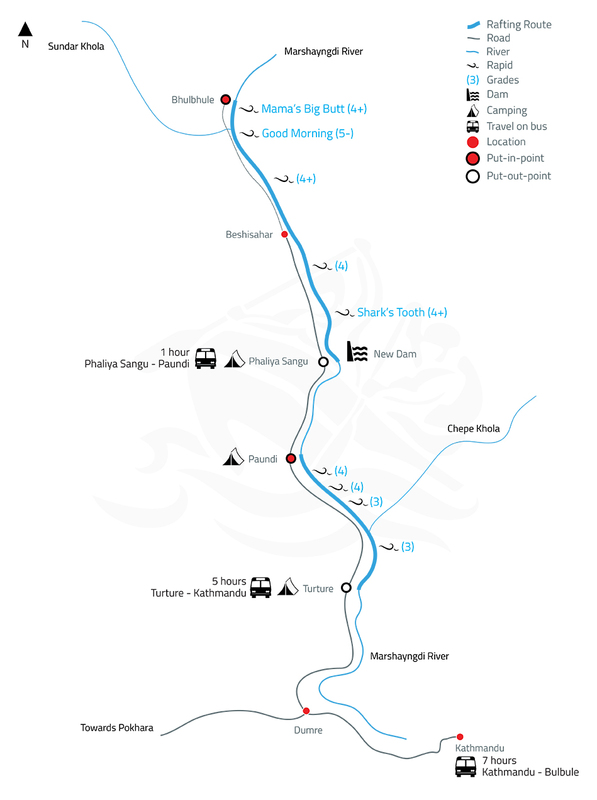 Our rafting expedition begins with a drive to Bhulbhule in Lamjung District, which is around 183 kilometers from Kathmandu. The day begins with rafting to Marshyangdi Hydro Dam from Bulbule. The ride gets bumpier as we hit continuous rapids of class 4 and 5. We will get to witness lush green jungles as we raft along the raging river. As there will be a break in the river we will driver to Paundi from the dam. We will spend the night at the city of Paundi. On the final day of our rafting journey, from our next put in point, Paundi, we will get back in the raft and head towards our final take out point, Turture. And from Turture you can either go back to Kathmandu or drive to Pokhara as per your interest.